The failure marks a major fracture in the Irish peace process and an acceleration of its decay. This decay is occurring despite continued popular support for the process and a very weak opposition, concentrated mainly in the ranks of physical force republicanism. The failure to arrive at an agreement is entirely the outcome of the internal contradictions within the settlement that ensure its ongoing decay. This is underlined when we realize that a successful outcome would merely have rebooted the local political assembly of a year ago – totally unable to carry out any serious political or administrative work and dedicated to the sectarian division of resources. In fact the talks failed some time ago. They failed within hours of opening when it became clear that the unionists would not agree to a compromise on the burning issue of flags. The flags issue, presented as an issue of cultural rights, involves widespread public intimidation with legal impunity, large sectarian mobilisations with the threat of violence and a background of physical attacks on Catholics. It is by far the most urgent issue with a new marching season on the way and the continued threat of serious violence. None of this made unionists willing to accept any restrictions on the weilding of this sectarian weapon. Although formulations were offered on parades the unionist were again unwilling to consider any form of restriction on the sectarian rights of the marches. The vast bulk of the Haass talks were been taken up by attempts to cobble together a statement that would cover this failure. The document was reworded again and again, with the nationalist parties indicating their willingness to sign almost anything and the unionists looking for endless concessions. The talks had been presented as dealing with issues unresolved by the peace process. Nothing could be further from the truth. 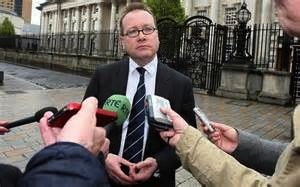 What is at issue is unionist rejection of the existing agreement. It was the DUP, the majority party in the local administration, that organised and led the flag demonstrations that sparked off the current crisis. The tearing up of a deal to have a peace centre at the old H-block site meant an end to DUP leader Robinson’s claims of a strategy of pragmatism and a renewed assertion of sectarian privilege. The reality that the nationalist parties and, in the background, the Irish government and the imperialist powers of the U.S. and U.K., were willing to concede to the unionists is of real significance, as are the cries of alarm from the moderate unionist Alliance party. The grounds of debate have moved from an imaginary “equality of the two traditions” to a division of sectarian rights. The unionists don’t accept that there is any need to concede anything to nationalists and want to assert supremacy. Capitalism is willing to go along with this if it offers a stable solution, no matter how sectarian or unjust. In the absence of any voices raised to assert an Irish democracy and a socialist alternative, further debate will rest on the ground carved out by the unionists during the Haass talks. The attempts to placate the Orange monster cannot succeed and will eventually bring the current house of cards crashing to the ground. 2. A NEW FLAG FOR THE NORTH OF IRELAND? 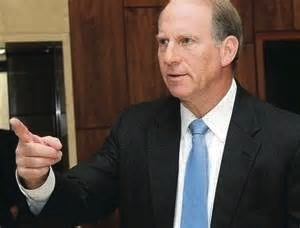 Unofficial U.S. representative Richard Haass has been called in to reverse the creeping collapse of the Irish peace process, concentrating on the investigation of past atrocities, the display of flags and disputes around marches. Following a series of meetings he intends to wrap up the process by the end of December. As he left the last round of talks, Haass asked the local parties to set up a number of working groups and to consider a number of questions. One question set was that the parties consider a new “Northern Ireland” flag. This proposal is significant. It is not impossible that a new flag be designed – loyalists love flags and, in addition to British, army and a host of Orange and paramilitary flags, have a special love for the Israeli flag. One more will not go amiss. What is impossible is that the unionists demote the British flag, stop using it as a truncheon to establish sectarian supremacy, or pass up any chance to insult the Irish flag. Richard Haass knows this is not a solution. Rather he is stepping back, emphasising his role of facilitator and handing the parcel back to the local parties. This completes the circle, Sinn Fein originally complained to the British about unionist rejection of the terms of the peace agreement in 2012. The British did nothing but, when Loyalist street mobilisations were encouraged by unionist leaders last November, they passed the parcel to Haass. This would have worked if the local parties were seeking a settlement, but unfortunately the drive to rewrite the settlement is led by the main government party, the DUP, and the British have made it clear that they will continue to placate the unionists. So Haass is stepping back and the chances of a new settlement guaranteeing stability will not be realised by an external imposition by imperialism, a point that he underlined as he returned for what he suggests will be the final round of talks. However help is at hand from the nationalist camp. They want the Irish national question to remain safely buried and are perfectly happy with the system of kickbacks and sectarian political patronage that dominates daily life in the North. The nationalists have clearly signalled that they will endorse a further shifting of the settlement to the right. The intervention of local Attorney General John Larkin with a proposal to draw a line under past atrocities – especially state atrocities – has been endorsed by leading political figures in Dublin and in the Catholic Church. Local commentators have expressed astonishment at the level of complacency in the Catholic middle class at sectarian displays and marches and at the level of impunity allowed to the loyalist demonstrators and paramilitaries by state forces. The fact is that the unionists remain the political base on which the British presence in Ireland rests. The Dublin government and northern nationalists realise that. Since they have no interest in a confrontation with Britain, stability can only be won by a full-blooded capitulation to loyalism. This was the code behind a recent report on the Haass talks by RTE, the Irish state broadcaster, when their chief political reporter said that a deal was possible if Sinn Fein followed “the example of Mandela”. So the focus of current talks is to obtain some promise from the unionists that indicates that this time they will stay bought while moving society back towards their spiritual home in apartheid 1950s Ireland. In this framework the difficulties of a settlement are immediately reduced. The issue of state crimes cannot be pursued if the political parties do not support it. Outstanding IRA charges can simply be put on the long finger. Victims’ complaints can be removed from the political arena and treated as a psychological issue of support and seeking closure. If cases against the IRA are excluded from any deal it would still work. Sinn Fein have stood still when ex-prisoners were barred from advisory posts at Stormont and five of their leading members facing current charges of IRA membership. The issue of marches remains difficult. For years Sinn Fein have expressed their respect for “Orange culture” and have policed nationalist protests. They have seen the small number of republican commemorations restricted. The British and the EU have poured out millions in bribes. In return they have looked for a moderation of the naked sectarianism built into the demonstrations to little effect. It seems that the latest proposals involve disbanding the utterly corrupt Parades Commission – however the context would be a shift to the right and local control of demonstrations. Sinn Fein are desperately searching for a mechanism that would prevent the unionists from simply pushing through all the marches. 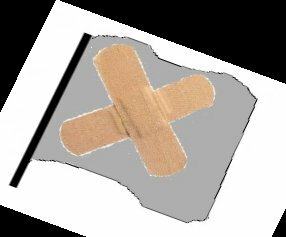 At first sight the flags issue is also soluble. Sinn Fein has been careful not to oppose the flying of British flags. It does not oppose: “British culture” but wants equal respect for “Irish culture.” Its proposal for a formal flag apartheid where each area flies a single flag is ludicrous, but clearly the thousands of loyalist and paramilitary flags produce their own instability. However if the unionist leaders see all their demands met they can bring their followers to heel. When the Northern state was firmly established, the internment regulations were used to imprison the most irreconcilable loyalists and bring the conflict to an end. So yet another settlement is possible, but will shift the balance of the class struggle. The weight of sectarian provocation will fall on the nationalist working class and they will find themselves under attack from the Church and middle class. 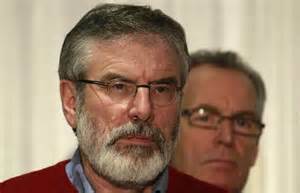 The spotlight will fall on Sinn Fein and their role and the decay of that party will accelerate. There is plenty of disillusionment and anger amongst workers in both parts of the partitioned island that can only grow. The regroupment of the class, the expression of its own programme and the construction of its own party will grow out of the decay of the imperialist settlement and the corruption of its local capitalist stooges. 3. STATE VIOLENCE – THE DEAD PAST? At a recent public meeting in Dublin to discuss the legacy of physical force republicanism one speaker recalled the Irish Garda “Heavy Squad” who had carte blanche to torture republican suspects. The contrast with today showed how far we have travelled, he said. This is a minor key of the majority sentiment in the North of the country. The very evident corruption, sectarianism and intimidation in today’s society can be set aside because the absence of widespread armed conflict shows how far we have come. The main divergence from this consensus come from families of victims, who play an especially destabilising role when they call for an explanation of assassinations carried out by the state. Even then the demand is to seek closure for something that has passed. From a socialist perspective the ideology of “how far we have come” is not accepted. State violence will be in the dead past when we bury the capitalist state and the imperialist role of the British in Ireland. From the opposite direction, the British state is very anxious to bring discussion of these issues to an end. State violence continues. What the state wants to bury is any popular understanding that they carried out these crimes and that they will continue to do so if they meet any serious challenge. A recent BBC TV investigation caused embarrassment. 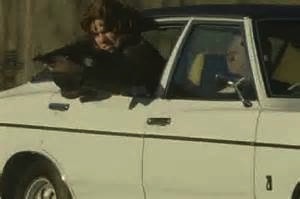 Members of an army undercover unit, the Military Reaction Force (MRF), boasted of touring Nationalist areas of Belfast in the early 1970s and acting as a death squad. What was striking was their supreme arrogance. They did not doubt for a second their right to kill civilians. Their main complaint was that they had never received sufficient recognition for their efforts. The most unusual thing about the programme was the acknowledgement by the reporter, unique in a compliant state media, that the MRF had been withdrawn because of incompetence and lack of control. It had been replaced by more effective units largely run through control of loyalist gangs. It was largely the use of death squads that brought about the military defeat of the IRA, the reporter claimed. In fact atrocity is a standard procedure in the British Army. The case of Sergeant A, recently found guilty of killing an injured Taliban prisoner in Afghanistan, led to much salt tears about a good man gone wrong. Evidence that the other members of the squad were equally guilty, that the killing was pre-planned and that it was a routine procedure were all ignored, as was the whole history of atrocity in colonial wars. In the North a massive MI5 base operates outside local structures and is tasked with spying on republican organizations. A unit of the SAS continues to operate. The recent Flag protests show a pattern of relative impunity for loyalist protestors and paramilitaries. A loyalist, found guilty of planting pipe bombs at a church and school, received a community service order. Derry Republicans, found guilty of possession of a pipe bomb, received up to four-year jail terms. agreement. Larkin makes it clear that he is going well beyond an ending of prosecutions to include a ban on outstanding inquests. What he wants to put behind a curtain is the truth about 30 years of a dirty war in Ireland. What does Larkin represent when he makes this call? He sees himself as acting in his role as chief legal officer and says that the state is “vulnerable” to inquests and enquiries. Behind this is a deeper reality. His appointment required the agreement of both the DUP and Sinn Fein. The outcome is someone from the Catholic far right. His views echo those of the Catholic Church and bourgeois Catholics, happy with a sectarian and colonialist settlement and uneasy at prospect of state atrocity becoming a running sore that might destabilise the process. The motivation for Larkin’s statement is linked to very acute timing. Richard Haass, representing U.S. and British imperialism, is currently drawing up proposals to yet again reboot an increasingly shaky settlement. Larkin is letting him know in advance that the dominant forces in Irish nationalism will be happy with any cosmetic mechanism that successfully buries the issue. Such a direct political intervention by the statlet’s chief legal officer created outrage among victims’ organizations. That outrage did not extend to the political groups. Both Peter Robinson of the DUP and Martin McGuinness of Sinn Fein issued restrained statements indicating that they disagreed with Larkin, but seeing no need to call on him to step down. The reality of their disagreement is rather different. Sinn Fein want to close the door on the past, but their preferred mechanism is a “truth commission” that would see an apology to the victims and an amnesty for all the combatants. The second Bloody Sunday whitewash, which blamed individual soldiers and cleared the state, left them entirely satisfied. From the DUP perspective the IRA campaign was entirely criminal and illegitimate. Their central policy for resolving the troubles was a shoot to kill policy and a leading member, fully supported by the leadership, is currently facing charges for approving a social media solution of assassinating the Sinn Fein leadership. The DUP want an immediate end to all questioning of the role of the state forces. Given the direction of loyalist violence by the state, this would involve a de facto halt to a review of the role of loyalist paramilitaries. The DUP will not under any circumstances agree to an amnesty for Republicans. However the DUP would be happy enough to quietly endorse some closure mechanism. They have a number of other means available to delegitimise republicanism. Many ex-prisoners have been banned from government employment. They have been banned from positions as government advisors. The Unionists have been successful in forcing a reroute of republican commemorations and persuading the British to denounce such commemorations as provocative and illegitimate. The idea that there is some balancing act going on and that the purpose of the Haas review is to preserve equity is deeply mistaken. The justification for a British military presence in Ireland is their loyalist base. The British had to use maximum pressure to force an acceptance of Republican surrender and in the period since have had to move the process to the right time and time again to quell unionist revolts. Even then the presence of Sinn Fein in the administration has eaten up a succession of unionist leaders. Now Haas is to move the process to the right once more. Nationalist Ireland, in the person of John Larkin, has told them that they will be content with the outcome. The difficulty will yet again be in ensuring that the unionists stay bought. Current suggestions include a further referendum. Alongside Haass a secret mechanism has been set up to agree local deals. This involves conferences in Wales and the inclusion of loyalist paramilitaries. Sinn Fein, sensing a car crash, have stepped back from the consultations, making their own proposals public and declaring it a “people’s process.” Their own proposal, that each area fly a single flag to indicate its political affiliation, shows how far it has moved from republicanism to Catholic nationalism. It also shows in stark detail the sheer fantasy of a society that bases stability on sharing out of sectarian privilege and the unlikelihood of the loyalist mob buying such an outcome. Yet the delusions of a harmless sectarian sharing held by Sinn Fein are the delusions of the Good Friday Agreement. They are the delusions on which Richard Haas will attempt to build stability. In this wonderland colonialism, the incitement of sectarian division, repression, state violence, all belong to the dead past. To paraphrase Mark Twain, it’s not dead, and it’s not even past. establishment to put to one side/”tolerate” or generally ignore anything which may require a change of attitude or policy, and assimilate it into ordinary “life”, Mick Jagger is a classic example, imprisoned for a minor drug offence (corrupting the morals of a generation in reality) and 40 years on is knighted for musical contribution, the point being that although the Republican movement has made great progress since the 1960s it must NEVER take its eyes off the main prize which is a united Ireland. The fact that the more bogged down the Brit/loyalist parties can make ANY forward progress in ANY negotiations in the hope that it’ll go away or that the will to continue will gradually wane should be at front of Republican thinking. THEY will “tolerate” it to extinction, and talk it to the moon and back, the only time any urgency will be shown is when their purposes are being best served. The Republican movement MUST show that we’re in it for the long haul (although I doubt an old guy like me won’t live to see it,) WE MUST NEVER GIVE UP, WE HAVE A JUST CAUSE, WE GO ON!. footnote: ANY risk of financial/business loss WILL have a bigger impact on the British Government (regardless of political colour) than any military or “civil” action, an assault on the city/business community will produce a result faster than any amount of negotiation ever will………. Always hit a capitalist in the pocket!!! Happy New Year everyone.